The other club members worry as Yui falls sick shortly before their live show at the school festival. This episode is officially the “final episode” of season 1, except not really, because it’s followed by two “bonus episodes”. It does function as the climax of the season even though it is not truly the last episode, however. If Yui’s line in “Cram Session!” about never having caught a cold is to be believed, then this is presumably her first time. Ritsu gets hit on the head once (for scaring the underclassmen). The songs played in this episode are “Fudepen ～Ballpen～” (aka. “Brush Pen, Ballpoint Pen”) and “Fuwa Fuwa Time”, both on the Ho-kago Tea Time album. First time, at least on screen, that Yui does the lead vocal on “Fuwa Fuwa Time”. The animation as Yui leaves the house is almost exactly like the animation at the beginning of “Disband the Club!”, except this time she doesn’t fall, doesn’t eat toast and carries Geeta on her back. Shots of her rushing back to school are similar as well. The flashbacks seen during the second chorus of “Fudepen ～Ballpen～” show moments from earlier episodes, but this time as seen from Yui’s point of view. Jun can be seen blushing with a wowed look on her face while she’s watching HTT’s performance. It’s probably safe to assume her interest in the Light Music Club begins here. The main story of this episode is based on chapters 10 and 11 of volume 2. The scene where they try out stage outfits is from chapter 9, and Yui’s dream about Mugi’s eyebrows comes from one of the “bonus comics” in volume 1. 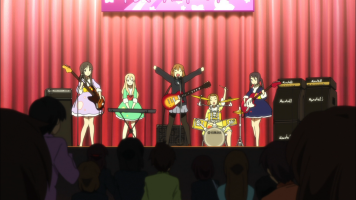 The biggest differences are that Yui didn’t have to run home for her guitar in the manga (Ui brought it for her), and the performance didn’t start without her. Also, their performance was a failure in the manga, not the triumphant climax it turned out to be in the anime. * listed simply as “unknown track” because it is not included on any K-On! OST album. ** This is a different version from the one found on the “Band Yarou Yo! !” CD, and is not included on any K-On! CD. I love this episode. Although it’s not the actual last episode, it is the perfect end to the first season. It doesn’t hurt that “Fudepen ～Ballpen～” is possibly my favorite song from season 1. The scene where Yui runs towards the school while Mio sings is one of the show’s highlights for me.